I finally found the hardcover graphic novel of Batwoman: Elegy by Greg Rucka and J.H. Williams III, and it was worth every penny. My local comic book store was sold out, neither Borders store could locate the copies that were supposedly there and I did not have the patience to order the book on Amazon.com, and suffer through waiting; I ended up waiting anyways. It took a third attempt at Borders before someone went to the back and found one of the three in-store copies that had been sitting there for five days. Batwoman: Elegy was originally released as Detective Comics issues 854 to 860 and I, of course, was late to the party on those issues as well, with almost all of them selling out immediately. Thus I waited for the hardcover so that I would have something beautiful to showcase on my bookshelf, along with my Captain America Omnibus , Invincible Iron Man Omnibus and my signed Immortal Iron Fist Vol. 1, 2 & 3. Now that I have the book in my grubby little hands, I am very pleased and almost hesitant to crack open this beautiful work of art. The book begins with a great introduction written by Rachel Maddow of MSNBC and the layout of the introductory pages is beautiful as well. The book itself is something that needs to be read three times: once for the highly engaging writing and superb storytelling from Greg Rucka, a second time for the gorgeous artwork of J.H. Williams III, and a final time for an immersion in the complete story--artwork, writing and all. 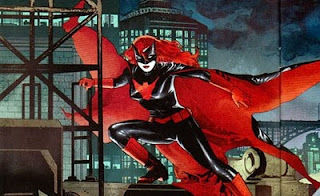 Kate Kane is Batwoman, a young tattooed, Jewish lesbian with extensive military and martial training, who is in possession of an extensive arsenal of equipment and weapons provided by her father, who she refers to as "Sir" and "Colonel." While at military school Kate's involvement with another female student is discovered and despite having the highest marks and aptitude, she refuses to hide who she is and chooses to leave the military life that she loved because of the "don't ask, don't tell" policy. Kate's discipline coupled with her father's remote guidance and intel makes her a formidable vigilante that few villains ever hope to stand a fighting chance against. She is fairly brutal in her treatment of criminals, but like Batman, she will not kill. I absolutely love her. The first half of the story concerns a Lewis Carroll inspired villainess, who goes by the name of Alice and is absolutely insane. She has come to Gotham City as the new leader of the Religion of Crime and is bent on wiping out a good portion of the city's citizens through the use of military-grade chemicals. 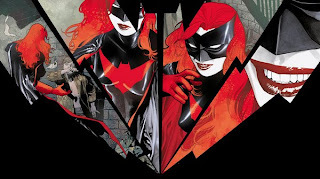 With the help of her father and some unlikely allies, Batwoman sets out to thwart Alice's deadly plans, but through the course of the conflict she learns a terrible secret that neither she or the reader will ever expect. The second half of the book centers around the origin of Kate Kane from childhood to when she becomes Batwoman, and includes some of her relationship with another vigilante The Question, Renee Montoya. This part of the book is interesting in that J.H. Williams III chose to use an art style that is similar to that used on Batman: Year One (also an excellent read), which is a telling of the caped crusader's earlier adventures. This chapter provides the history of what drives this rich and complex character and is startling with some of the critical reveals. The story is incredible with plot twists that I never expected, and J.H. Williams III's artwork is masterful and counted among my other favorites John Cassaday, Tony Harris, Dave Mckean and Darwyn Cooke. Prior to the release of this book, Greg Rucka has left DC comics to pursue his own creator-owned projects, but J.H. Williams III is slated to take up the writing and art chores for the first story arch of a forthcoming new Batwoman comic series. A definite must own book for anyone who enjoys the Batman mythos, compelling writing, stunning artwork, beyond strong female characters, or all of the above. Batwoman is also the highest profile gay character currently put out by DC comics. I hope that she is here for the duration. Very, very highly reccommended.